Surely there’s very few spots in the world where you can get takoyaki, forno oven-cooked pizza, pastries made from heritage wheats that are milled onsite, empanadas made by an Argentinian, and a selection of wine and beer curated by one of the world’s best female sommeliers all under one roof. Here in Winnipeg, this place is called The Forks Market, which is home to food kiosks from some of the city’s best restaurants and food trucks, a casual fine-dining restaurant by one of our most-acclaimed chefs, and a bar called The Common, where you can get pints, glasses and flights of beer and wine which – get this – you can sip on nearly everywhere on the first floor of the Market (with a second floor liquor license soon to come too!). So while you are home making like Santa – that is, making your list and checking it twice – we have a new list for you on some can’t-miss dishes and drinks you’ll find at The Forks. The aforementioned world’s best female sommelier is Véronique Rivest, who regularly stops into Winnipeg to update the choices at The Common. While we’ve already written an article about why she and the selections (and serving temperatures) at The Common are so great, we also feel the need to point out the mighty fine selection local beer currently on tap. For starters, Half Pints, one of the city’s original microbreweries is getting festive – make that very festive – with a Winter Spiced Red Ale, that is like the ginger cookies of beers (in the best way possible). Even more richness can be found on Tap 5, where Stone Angel’s Marcellus Peanut Butter Stout currently resides. We liken it to the beer version of the milk that you would drink at the end of bowl of Reece’s Peanut Butter Puff cereal, but in an even more delicious way. For something that looks a little more tropical, but that has more than a hint of hops, look to Kilter Brewing’s (who are flatmates, along with Devil May Care, at Stone Angel’s tap room at 1875 Pembina Highway) Juicii New England IPA, which, with it’s pineapple colouring, is asking to be shown on your Instagram account. Equally summer is Nonsuch’s Belgian Blonde, which will pull your palate into warmer times featuring plenty of apricots, while rounding out the locals is Little Brown Jug’s classic 1919 Belgian Pale Ale, which, like the 1995 Giller Prize winner, is a Fine Balance (this one being between tart and sweetness, instead of the complications of life in India in the mid-70s). #mostobscurebeerreferenceever? You can find the full selection currently available at The Common here. 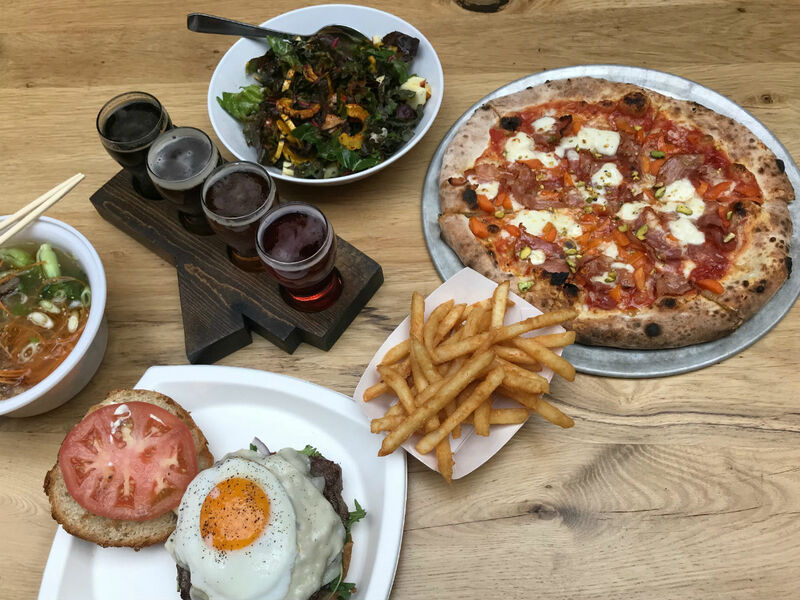 One of the most welcome recent additions to the Market is Fools & Horses, whose modbar setup frames the main market area, directly across the room from The Common and right underneath Tall Grass Prairie’s flour mill. On top of a full espresso menu and a fine selection of beverages from kombucha to Green Carrot Juices, F&H can also make you a boozy coffee with Baileys, which is perhaps the height of après skate beverages. For something super refreshing, check out the Red Ember Common (more on them later too), whose housemade soft drinks are delish – particularly the grapefruit soda, which they spin into a radler using Half Pints’ St. James Pale Ale (a little bike joke there for all you cyclists). And get this should you be looking to spring 2019: An outdoor Common concept is in the works, so fingers crossed we’ll be enjoying some of these delicious beverage options on a patio at The Forks come summertime. Empanadas & Company by Simon’s Cuisine – chef/co-owner José Strum comes from Argentina, the land of beef, so when he proclaims (via a Facebook banner) that they have “the best steak sandwich in Winnipeg” you should probably go try one – which we did two weeks ago, and let me tell you I agree with that statement. The Gaucho features tenderloin simply salted and seared on the flattop then slathered in all manner of sauciness, including a horseradish mayo, chimichurri, and a slightly runny egg, and Pete’s pyjamas is it delicious. Not only that, but it is spoon-tender, meaning you can actually pick this sucker up and bite into it without worrying about having to tooth-wrestle your sandwich, which is of course the downfall of many a steak “sandwich.” On top of that, his baked empanadas are the bomb – particularly the vegetarian numbers like the spinach-ricotta and blue cheese with figs and mozza. If you are looking for some comfort food classics, look to a few of the busiest spots in the Market, those being NuBurger, Fergie’s Fish ‘n Chips and Skinner’s. Skinner’s has been holding it down since 1929 in the province (Lockport, MB to be precise), while they still make their own hotdogs, which is a rarity these days. Speaking of a rarity, NuBurger utilizes only grass-fed beef for their burgers, while the local chain (they now have four locations) is so green they are one of only a few Winnipeg restaurants to achieve L.E.A.F. certification, as they recycle or compost almost everything. On top of these ethics, they obviously also make some really tasty burgers (they had a stranglehold on the Le Burger Week People’s Choice title from 2013 to 2016, and served over 1,000 burgers in one day during this year’s Le Burger Week), with plenty of healthier options too. Our one insider tip is that they have the best yam fries, which you can make even better by asking them to add their curry salt to. (For more award-winning flavours see Kyu Grill, who have now won ManyFest Food Truck Wars’ People’s Choice Trophy for four straight years with their Heroshima skewered sandwiches). As to Fergie’s, go with the fish and chips, which we’ve heard many travel writers state to be one of the finest forms in Canada, with a batter that is always audibly crisp all while housing walleye that is steamed to perfection. For something a bit more out of the box Fusian Sushi not only has some artfully presented fish and rice, but some pretty solid sides too, including takoyaki that hits all the points – crunchy crust, creamy interior, and smoky, slightly chewy octopus in the centre. It’s a great one to order if you are with kids, as the bonito flakes on top wave around like leaves in the breeze. Many people consider the aforementioned Red Ember Common – which is more of a full-service restaurant, with its bar that wraps around its forno oven and unique wine and beer list – as having the best pizza in Winnipeg, and we won’t put up much of an argument there. That being said, our fav is the Crete-Za, a seemingly simple looking pie that is a flavour explosion due to swirls of dill pesto, goat cheddar and these little cubes of pickled onion that have a texture like gummy bears (for lack of a better comparison), as they are sweet and slightly chewy. Plus, almost everything on the menu comes from Zinn family farms, who specialize in pasture raised heritage pork and all manner of veg. Comfort food tonight: risotto, asparagus, charred eggplant, n’duja, hazelnuts, parmesan. Come down! Finally, we can’t talk food at The Forks without mentioning Passero, chef Scott Bagshaw’s Italian share plates restaurant that has been met with many rave reviews – including five-stars from the Winnipeg Free Press and making the enRoute long list for Canada’s best new restaurant. The pasta dishes here are exceptional, with the current incarnation of the gnocchi – featuring brown butter, black truffle and boar bacon – being one of the most delicious wintery bites you can get. Plus, the service here is second to none, while the design makes you feel like you are dining within the hull of a ship striped to the ribs, allowing you to look out into the bustling market. Passero also has a lunch counter called Corto that serves up an incredible array of Italian sandwiches. And please, let this serve as just a sample. For a full run-down on all the food kiosks at The Forks click here.